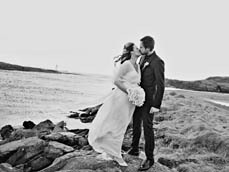 I had the absolute pleasure and honor of photographing Siw and Jan Frode on their wedding day. The two were married last month on TV as part of a Norwegian television series! We got a chance to head to the sea and and downtown of Haugesund, Norway juuuust before there was no light left in the day. Siw wore 2 incredible Leila Hafzi dresses. Simply stunning! Check out this video of Siw picking out her wedding dress with Leila!